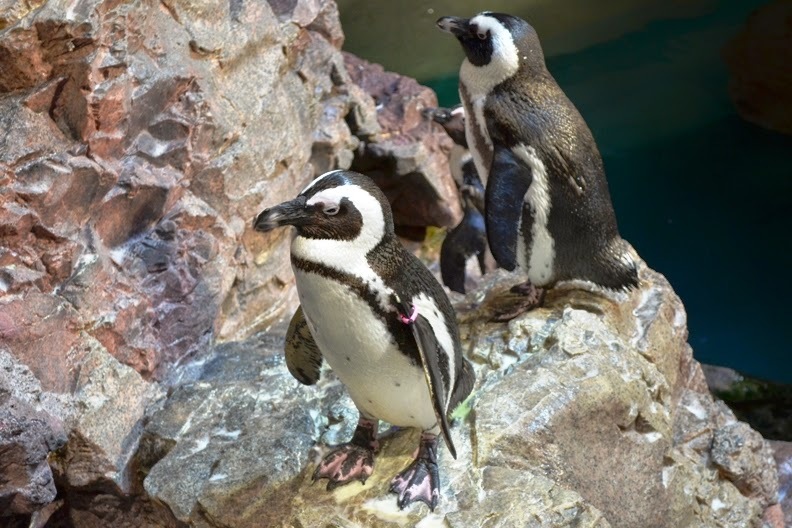 Many people are familiar with the “tuxedo” coloration of our African penguins. The white belly and black backs are distinctive and well known. But ever wonder why they have this coloration? Believe it or not, it’s a form of camouflage called countershading. And it's not just for penguins—many aquatic animals have this special coloration. Countershading refers to an animal as having dark coloration on the upper side of the body and a lighter color on the underside. If a predator swims above a prey item, like a penguin, and looks down, the dark back coloration blends in with the shadows or the dark ocean bottom. On the flip side, if a predator is underneath and looks up, the white or light colored underside of the prey blends in to the lighter colored sky/top of the water. 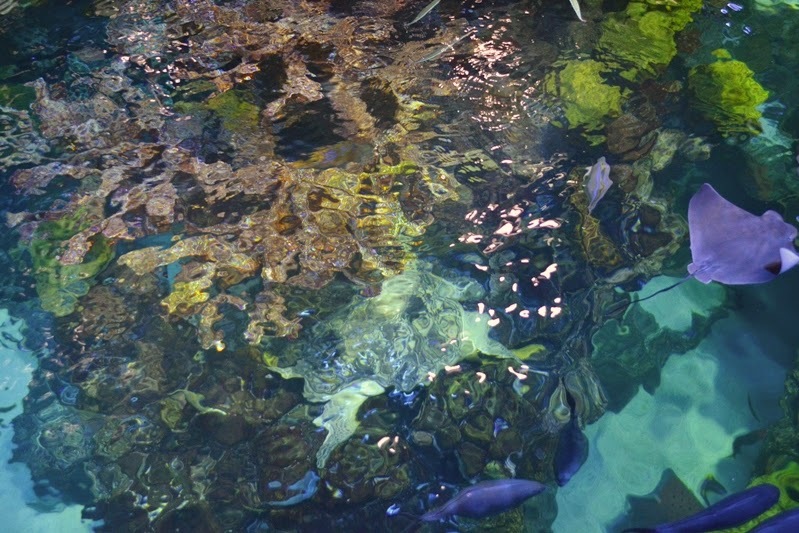 You can find examples of countershading throughout the Aquarium. And it’s not just for prey items—countershading works for predators too! Just as it allows prey animals to hide, predators take advantage of their countershading and become stealthy, blending into their surroundings. Take a close look at our stingrays—lots of countershading examples here! 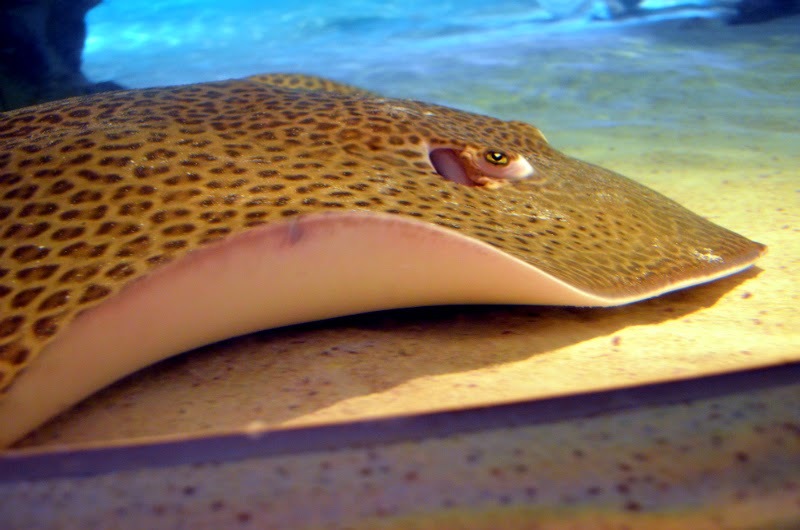 Our leopard whiptail stingray even adds some fashionable spots, some disruptive camouflage, to the mix. Dark leopard spots add to the effect-very fashionable! Want to take a nap undisturbed? Not a problem if you are a green turtle. 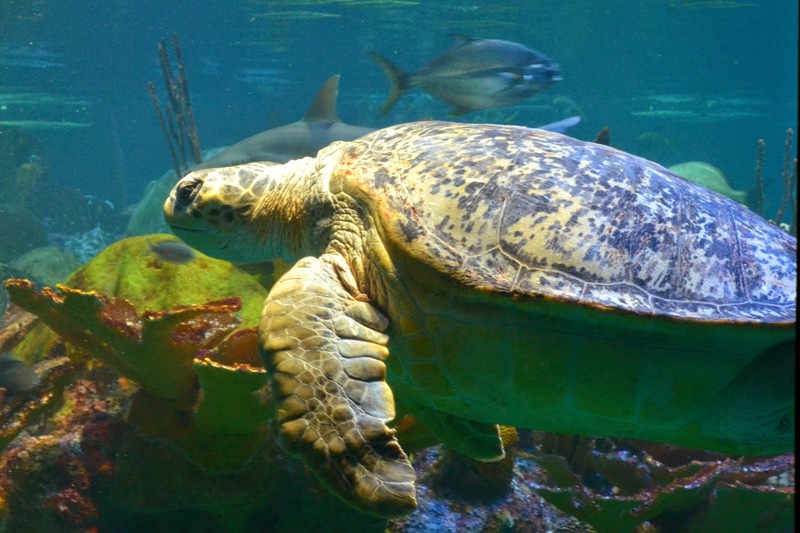 The mottled color on their carapace blends in to their coral reef surroundings, while their light colored plastron protects from predators below while they are swimming. Even Myrtle can camouflage into the reef! Can you find her in her favorite napping spot? The turtle version of hide-and-go-seek! 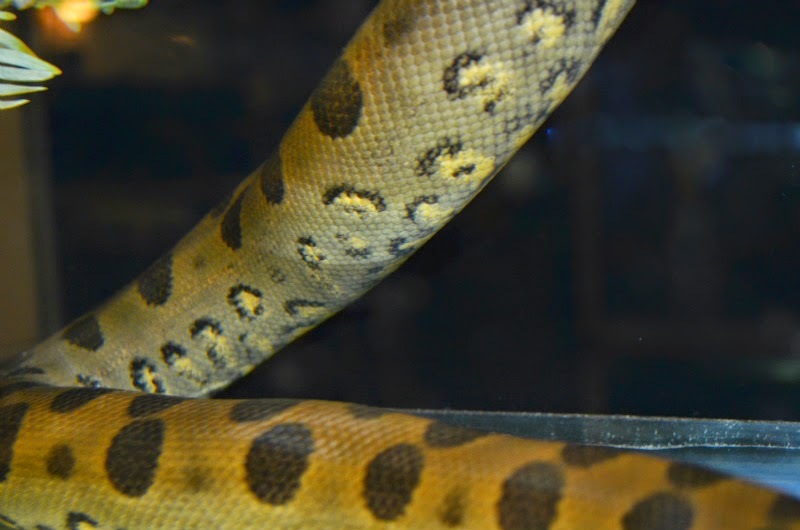 Green anacondas may grow to be over 25 feet long, but they still use countershading! When small, dark olive spots help juveniles blend in with tree bark and light belly spots blend in with the dappled sunlight and leaves. Once they move into their aquatic homes, anacondas benefit from this coloration as well. Dark backs blend in with dark riverbeds and light colors blend in with sunlight from surface of the water. Countershading isn’t just for animals with backbones-some of our cephalopods are countershaded. Check out the nautilus and the cuttlefish in the Tropical Gallery! 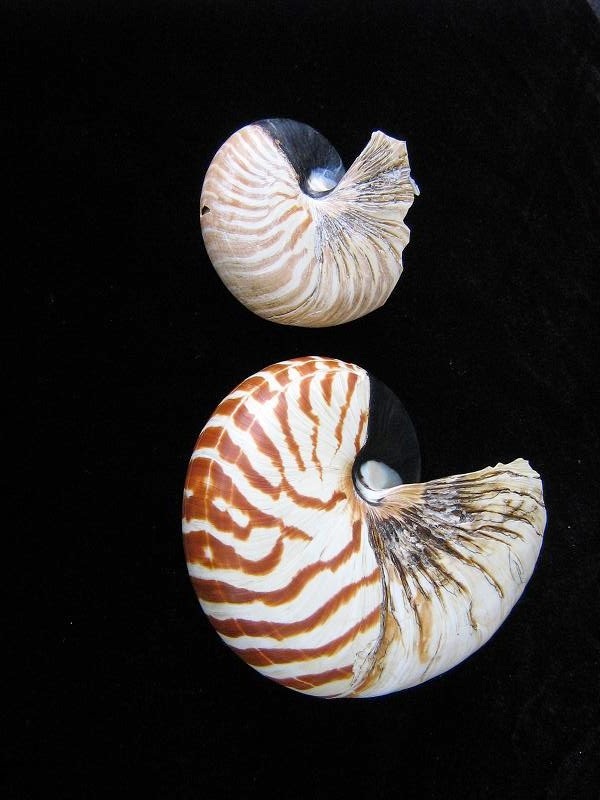 Nautiluses have dark stripes on the top curve of their shell to blend in with the dark ocean bottom. 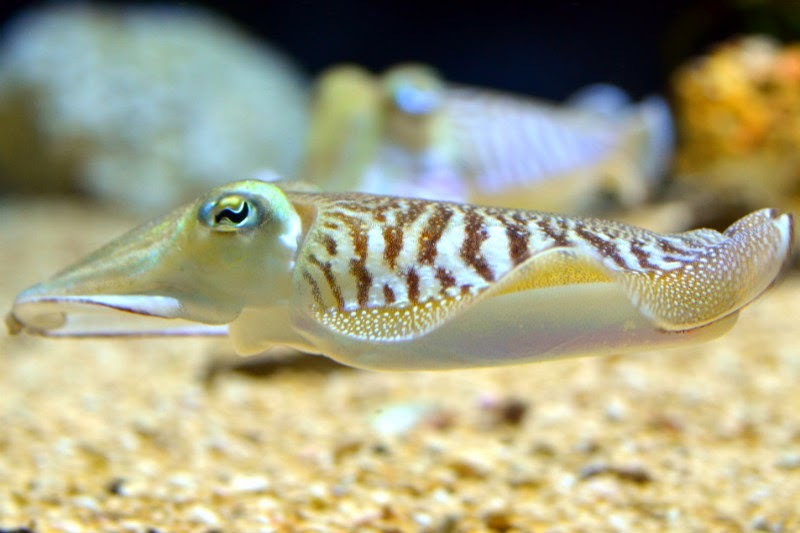 And while cuttlefish can instantly change their color to blend in with their surroundings, they often are countershaded to avoid predators! Countershading—it’s not just for penguins! So next time you visit the Aquarium, take a closer look around you. See how many animals you can see with countershading-if you can find them. Happy looking!